Today, we are starting a new series of vintage video performances of songs that hit number 1 on the pop, R&B, country and albums charts in the U.S. along with the British singles and albums. On this day in 1968, James Brown went to the top of the R&B Singles chart with his sixth chart topper, Say It Loud - I'm Black I'm Proud (Part 1). Written by Brown and Alfred "Pee Wee" Harris, the song topped the R&B charts for six weeks and went to number 10 on the Hot 100. It was also his first record to feature Fred Wesley on trombone. Among the other musicians playing on the track were Maceo Parker, Clyde Stubblefield and Ellis. 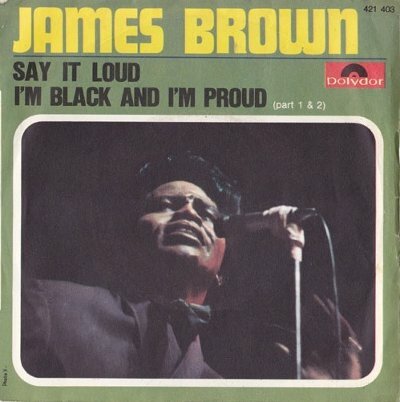 Here is Brown performing the song in a medley with "If I Ruled the World" which was the b-side of his top ten single from earlier in 1968, "I Got the Feelin'"